Isa-Bella Leclair is a likeable young Canadian woman. She is studying Civil Engineering at the University of Ottawa, plays the guitar and piano, practices yoga, loves spending time with her friends and – like many in her age-group – keeps an Instagram account. This is where Isa-Bella publically shows how she differs from most 21-year-olds. Her right leg is almost twice as thick as the left, because Isa-Bella has been living with Parkes Weber Syndrome since birth. This causes abnormalities in the blood vessels, which is why lymphatic fluid accumulates in the individual limbs. As a result, Isa-Bella Leclair developed lymphoedema. In the medi healthcare interview, she reports on how she masters everyday life with the disease, what role compression garments play and why everybody should enjoy life passionately and confidently. Ms Leclair, you suffer from Parkes Weber Syndrome (PWS). When was the diagnosis made? What are the symptoms of the disease and when did you recognise the first signs? Is the Parkes Weber Syndrome curable? How was the disease treated in the past? Was the therapy successful? 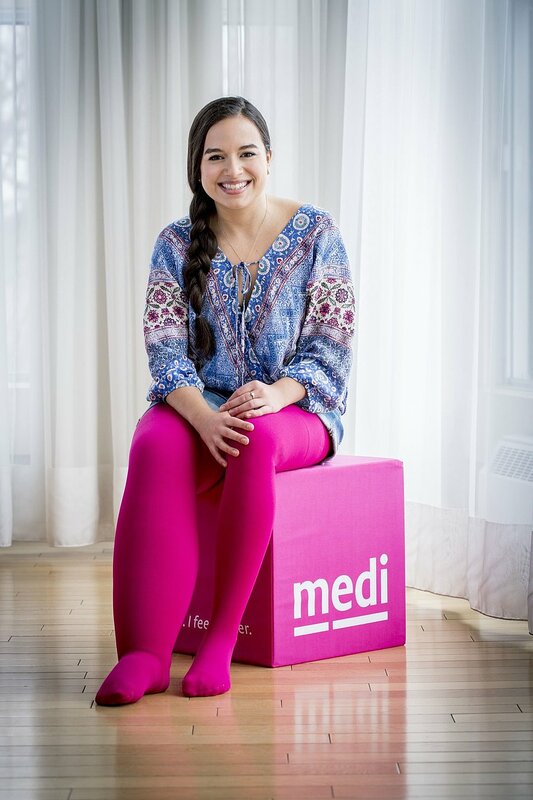 How did you hear about medi and our compression stockings? What is your experience with the mediven flat knit garments? Do you wear compression garments in bright colors? Where do you get information about the issue lymphedema? Do you get support from your family and friends? Do you have any special hobbies? What kind of sport can you do with the syndrome? Do you have any contact with other lymphatic patients? You are very open-minded and published your story of Instagram. Why did you do that? Is there anything you would like to say to people who are not very self-assured? Ms Leclair, many thanks for the interview. PWS is a complex congenital abnormality of blood vessels (angiodysplasia). It is caused by an unnatural, direct connection between a vein and an artery (arteriovenous fistula). This results in one-sided gigantism of the lower limb (hypertrophy of the bones and soft tissues). A port-wine stain (naevus flammeus) often covers the affected area. Some patients also develop lymphoedema in the affected leg that accentuates the asymmetry of the two lower limbs. Although the transition from PWS to KTS is smooth, the cause of the latter form of blood vessel abnormalities is not an unnatural connection between a vein and an artery. The exact cause has still not been elucidated. The external appearance of Klippel-Trénaunay Syndrome is similar: gigantism of the affected limb, formation of a naevus flammeus and the onset of varicose veins (varices). Important note: It is essential to distinguish between the two syndromes, because the treatment is different. While surgical intervention may also be useful in PWS (e.g. embolisation), KTS is mainly treated conservatively. Lynn Vaillancourt (J. Vaillancourt Corp. Valco, Canada) first saw the picture of Isa- Bella in a bikini with the caption ‘Born this way’ in 2015. “Many patients with lymphoedema are sometimes discouraged and often tend to hide their limbs. So I was impressed by Isa-Bella’s positive message and found her to be ideal as the image for lymphoedema in Canada”, explains Lynn Vaillancourt. The result is an inspiring cooperation with photos and a short video. Valco also invited Isa-Bella to be a speaker at the 2017 Canadian Lymphedema Conference in Montréal where she gave an empowering presentation to patients from all over Canada. All images are property of J.Vaillancourt Corp. Valco and are not available for download.